Place the 10 anchovy fillets, coriander and mint in a food processor and blend for 1 minute. Add the oil and lime juice and a touch of salt and blend for 1 more minute. Preheat grill to the highest setting. Place the 30 anchovy fillets into a container and sprinkle over the garlic, zest and parsley. Drizzle with a little rapeseed oil. 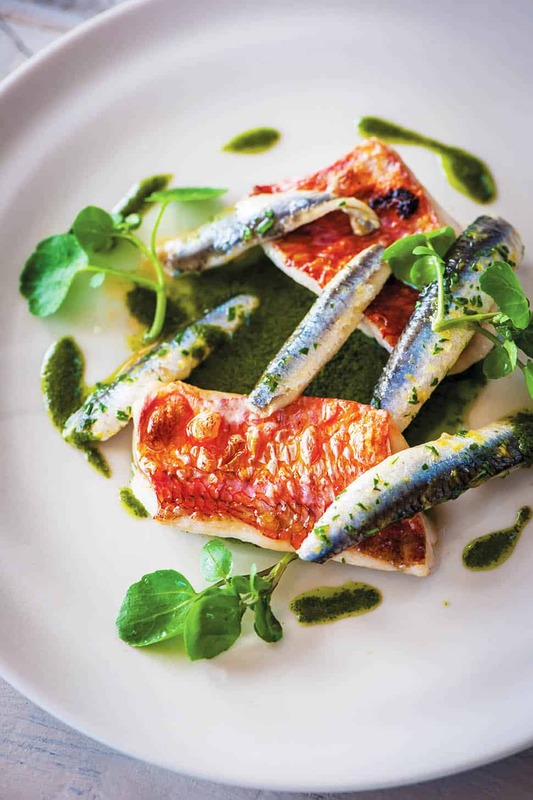 To cook the fish, place the red mullet fillets onto a grill tray and drizzle with oil. Season with salt and pepper and place under the grill. Cook for 3 minutes until golden. Serve immediately with the anchovies, dressing and a little salad.